The evolution of GCI work in Egypt reflects the adoption of a more holistic approach to conservation. 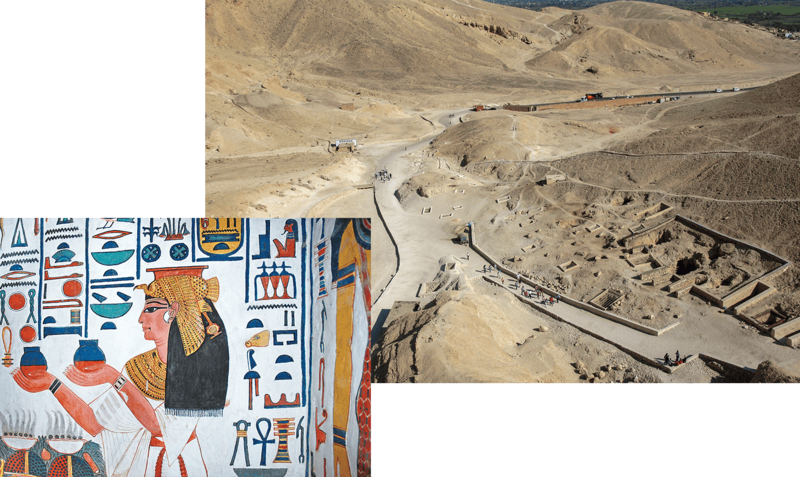 GCI field projects began in the 1980s with conservation of the wall paintings in the Tomb of Nefertari and continued more recently with development of a conservation and management plan for the Valley of the Queens, where the tomb is located. Left: A wall painting in Nefertari’s tomb. Photo: Martha Demas, GCI. Right: A broad view of the Valley of the Queens. Photo: Will Raynolds, GCI. Anniversaries are cause for celebration, but they also provoke reflection on all that has come before and all that might lie ahead. As the Getty Conservation Institute turns thirty, it is fitting to reflect on our own history and accomplishments but also on the ways that the conservation field has evolved more generally in this same period. The political, social, economic, and technological developments that have characterized the latter part of the twentieth and early years of the twenty-first centuries have created an increasingly complex context for the understanding and conservation of cultural heritage and have provoked evolution in both thinking and practice. Today, conservation is generally understood to mean all the processes of looking after an object or a place so as to retain its cultural significance.1 It is not simply about technical solutions or individual objects but about an integrated approach that includes planning and management and a consideration for the larger historic environment, be that a place or a museum collection. All of this demands a long-term view and sensitivity to economic imperatives but also an understanding of what is significant and to whom, and how that significance is vulnerable to loss. This does involve attention to the retention and repair of physical fabric, but not divorced from the cultural, social, and economic forces that both created it and continue to affect the way it is used, valued, and cared for. Public participation and dialogue are essential components of the process, as are various kinds of research and an interdisciplinary approach to problem solving. Understood this way, conservation is not so much about preserving vestiges of the past as it is about the dynamic management of change and the continuity of transformation that all objects and places undergo through time. In many ways, the Getty Conservation Institute is unique among institutions dedicated to the conservation of the world’s cultural heritage. Though there are a variety of organizations today that, to varying degrees, conduct conservation-related activities and share similar goals, their specific structures, aims, mandates, and approaches differ widely from each other and from those of the GCI. Unlike intergovernmental organizations, the GCI has no member states to set its agenda. Unlike national organizations, it has no sites or collections to maintain, no geographic boundaries, and no political mandate. The GCI is not a membership organization, so it has no constituency other than the profession. Though the J. Paul Getty Trust does have a grant-giving program in the Getty Foundation, the GCI does not provide funding for projects or engage in advocacy. And while education is a central part of the Getty’s mission, the Institute does not confer degrees or provide entry-level training for conservators. In brief, the GCI is best described as a private, international research institution focused on the creation and delivery of knowledge that will benefit the professionals and organizations responsible for the conservation of the world’s cultural heritage. As one of the four operating programs of the Getty Trust, it is also part of the Getty’s larger philanthropic enterprise dedicated to advancing the understanding, conservation, and enjoyment of the visual arts. Since its early days, the GCI has interpreted visual arts in the broadest possible sense to include paintings, photographs, objects and collections, buildings, archaeological sites, and historic urban landscapes. Thus, our work deals with an extraordinary diversity of artifacts and issues, essentially with both movable and immovable cultural heritage. The GCI has a multidisciplinary staff of about eighty professionals including scientists, archaeologists, architects, conservators, planners, and specialists in subjects such as documentation and education. However, most of the Institute’s work is carried out in partnership with other organizations, extending its reach in terms of expertise, resources, and geography. Since its inception, the GCI has devoted itself to particular issues and areas of work that were identified as underserved or of particular importance to the conservation field. These include preventive conservation and managing museum environments; the conservation and management of archaeological sites; earthen building materials and technologies; photograph conservation; strategies for seismic mitigation and reinforcement of historic buildings; and the conservation of decorated surfaces, such as wall paintings, mosaics, and rock art. The trajectory of the Institute’s work in some of these areas is traced in this edition of Conservation Perspectives. At times in its history, the GCI was undoubtedly responding to contemporary trends in thinking and practice; at other times, the Institute has taken a more proactive role in leading change. GCI education efforts have advanced from short courses to initiatives that include course work followed by supervised periods of mentoring. Left: A one-week GCI course on preventive care of historic photos, held in October 1987. Photo: Thomas Moon, for the GCI. 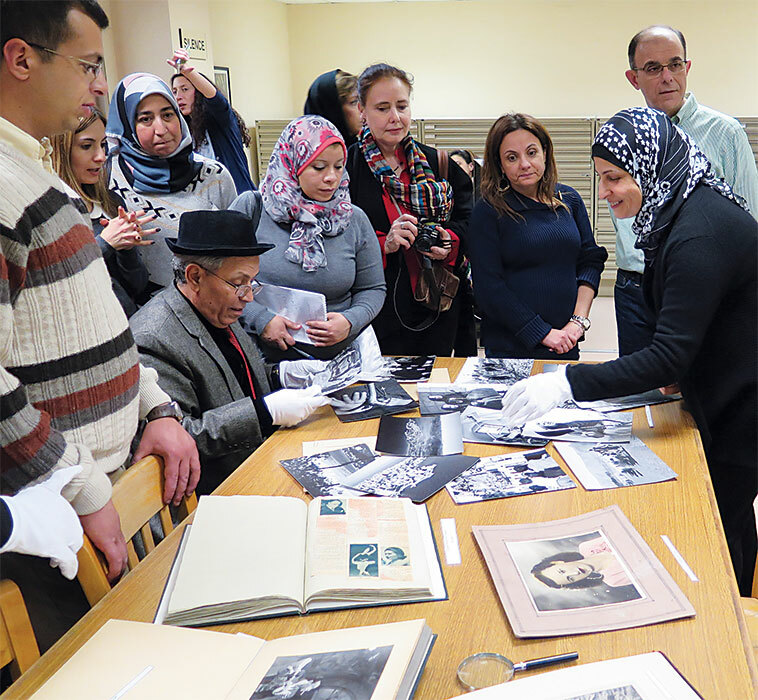 Right: The January 2015 concluding workshop in Beirut, Lebanon, of a Middle East Photograph Preservation Initiative course that began with a workshop in Amman, Jordan, in January 2014. Photo: Tram Vo, GCI. So what are some of the important characteristics of GCI work that reflect the evolving nature of the conservation field over the last three decades? Surely the most overriding change has been the adoption of a more holistic approach that looks not just at a particular object or building but at the larger environmental and cultural context. In a sense, the GCI’s work in Egypt, beginning with the conservation of the wall paintings of the Tomb of Nefertari in the late 1980s and continuing more recently with the development of a conservation and management plan for the Valley of the Queens, is a microcosm of the evolution in thinking that has taken place in the conservation field. Beginning with a consideration of the individual object and a focus on its physical conservation and presentation, the GCI later worked with Egyptian colleagues to consider larger contextual issues of planning and management, an understanding of the natural, social, and political environment, and the capacity and conditions required to ensure the long-term protection of the site by those entrusted with its stewardship. The last thirty years have also seen a greater emphasis on preventive conservation—essentially measures to manage and mitigate the risks to objects and sites—as opposed to a previous focus on remedial intervention. Some of this reflects the practical reality that repeated treatments are both costly and potentially ineffective if not carried out within a broad framework that includes environmental control and strategies for monitoring and maintenance. This trend is evident both in museums, where the concept of acceptable risk is being reevaluated in light of energy conservation concerns, and on sites, where the sheer magnitude of heritage to be preserved precludes conservation and presentation of every detail. For example, preventive measures like sheltering and reburial are increasingly important to the conservation of archaeological heritage, as are visitor management strategies that both protect the site and improve the visitor experience. Related trends are seen in conservation science. At the GCI and in the field more generally, science has evolved from a focus on treatment and the development of new treatment materials to a more profound understanding of decay mechanisms, improvement of analytical technologies to better identify materials and understand their deterioration, and design of preventive conservation strategies like oxygen-free display cases and safer museum lighting sources. Analytical instruments have become more portable, allowing them to be brought to the object or site rather than the other way around, and there are a growing number of sophisticated noninvasive techniques that permit detailed analysis with little or no sample material. Scientists are integral members of project teams (rather than simply the recipients of samples for analysis) and, increasingly, have specialist knowledge in both a scientific discipline (like chemistry, physics, or biology) and conservation. Education, too, has seen significant developments at the GCI and elsewhere in the field. After an early focus on short training courses, our approach now is to think longer-term. Most current GCI training initiatives involve some type of course followed by supervised periods of mentoring during which the trainees gain confidence with new ideas and approaches and build relationships with each other and the larger professional community. Similarly, from a focus on more technical aspects of repair and treatment, GCI training initiatives now incorporate larger issues of planning and management and present a broader framework for decision making. This approach to education is more labor intensive, but it ultimately builds capacity that is sustainable in the long term, especially in parts of the world where access to specialized conservation education remains limited. In recent years, the GCI has also placed increasing emphasis on the development of didactic materials that can be used by others and has begun to experiment with new modes of delivering training, such as distance learning. Finally, the Institute’s work has also reflected recent developments in the way that information is disseminated and made available to a variety of audiences. Our commitment to traditional print publications remains strong, but in recent years we have increasingly utilized electronic media to make information more broadly accessible. This effort includes richer content on the GCI website, the continuing digitization of out-of-print publications to make them available free of charge as PDFs, and a much greater presence in social media, including a GCI YouTube channel with a growing number of videos. The Getty’s founders envisioned an important role for the GCI in the dissemination of information to the field. This remains central to the GCI’s mission, but with an expansion in volume and modes of delivery that could not have been foreseen thirty years ago. If anything, the context for our work has become even more challenging. The conservation field has expanded in scope and in the variety of professionals engaged in it. Government resources for cultural heritage continue to decline, and there is serious competition for private sources of funding. Conflict and political instability threaten heritage in many parts of the world, as do rapid population growth and urbanization. Climate change has led to heightened risk from natural disasters and the need to develop more energy-efficient approaches to conservation and management. The rapid development of digital technologies has created both new opportunities and new challenges. And, of course, the heritage of the recent past is coming of age and is at increased risk. Herant Khanjian, GCI assistant scientist, removing a paint sample for analysis in 2005 as part of the Modern Paints project. Two years later, the project became part of a larger and long-term GCI research initiative that is looking more broadly at the many and varied conservation needs of modern and contemporary art. Photo: Dennis Keeley, for the GCI. Clearly, no single organization can deal with all of the issues faced by the conservation field. In the years ahead, the GCI will continue to develop areas of work in which it has a long history while attempting to address emerging needs. For example, in recent years we have expanded our role in the conservation of modern and contemporary art and architecture, and we envision that this will be an important area of work going forward. We also aim to better integrate our work in the realm of archaeological heritage to address more effectively tourism and visitor management issues, and we have begun to invest more strategically in the area of historic cities. Preventive conservation will remain an important component of GCI work and will be broadened to develop more sustainable climate control strategies for museums and to carry out targeted research to better assess risk to collections. The Institute will continue to invest in digital technologies for conservation, including improvements to the Arches system for heritage inventory and the creation of a framework for the better integration of scientific data generated in the study of particular objects and sites. And, of course, publication and the dissemination of information will remain central to the GCI’s mission. Yet there are broader challenges that must be addressed by the conservation community at large if the field is to retain its relevance and impact in the years ahead. The number of academic programs offering specialized training in conservation has increased substantially in the last thirty years. However, these tend to be concentrated in certain parts of the world, with other regions having little or no access to conservation education. And while there is general agreement on the knowledge and skills needed to create entry-level conservators, there is much less agreement on what constitutes a conservation architect, conservation scientist, or site manager. Moreover, as the field has become broader and more complex, it has become increasingly important not just to provide conservators with a sound theoretical basis for their practice and strong scientific and technical skills, but also to provide the ability to think critically, to communicate with a variety of audiences, to deal with conflict and arrive at negotiated solutions, and to work effectively as members of interdisciplinary teams. To improve the quality of conservation education generally and to ensure that conservation professionals are equipped to face current challenges, the academic and professional communities may have to rethink both what is taught and how conservation education is delivered. It will also be necessary to better define various professional profiles and the training required to achieve recognized competence. Conservation science is now recognized as a discrete area of enquiry. The last thirty years have seen an increase in the number of institutions involved in heritage science and a growing body of scientific literature. However, as with education, recent studies of conservation science indicate that the vast majority of activity occurs in particular parts of the world (largely North America and Europe, with growing constituencies in Latin America and Asia).2 Also, there is no clearly defined profile or educational route for the conservation scientist. Similarly, though various national and international funding programs for cultural heritage science have appeared in recent years, available financial support for the sector is again diminishing. As has been pointed out before, conservation research will never be competitive unless it can demonstrate both a consistent level of quality and the importance of conservation-related issues to larger scientific and societal concerns.3 To do this, the profession needs to work together to develop cogent national and international research strategies that will be compelling and will justify support at the highest levels. This demands stringent evaluation of work against defined indicators to prove the value and relevance of conservation science in the policy arena. Despite the rapid development of digital platforms for communication, there are still many parts of the world where access to information is severely limited. As a profession, it is important that we work harder to get information regarding the conservation of cultural heritage to those who need it most. This involves more creative use of digital media, more open access to relevant professional journals, the production of publications in both digital and print form, the translation of critical texts into a variety of languages, and the strengthening of professional networks. There are undoubtedly economic challenges in the publishing industry that need to be addressed to facilitate easier access to information, but these are not unique to the conservation sector, and sustainable models have begun to emerge. The conservation profession has not been very effective at making a case on the political level for its importance and legitimacy. Though heritage conservation is undoubtedly one of the most important intellectual movements of the last century and profoundly contributes to the public realm, it is threatened by a lack of policy attention and a low public profile.4 If the field is to thrive, it must better articulate its value to society at large and find more effective ways of communicating with a variety of audiences. In the words of David Lowenthal, “Posterity is conservation’s prime concern. Being answerable to it is our main duty.”5 As the GCI enters the next phase in its history, we remain convinced that the conservation of cultural heritage contributes not just to our understanding of the past but also to the quality and diversity of the world that will be passed on to future generations. In preserving objects of beauty and memory that represent our shared humanity, we strive to promote a more civil society. It is in this spirit that the GCI looks to the future. Jeanne Marie Teutonico is associate director for programs at the Getty Conservation Institute. 1. The Burra Charter: The Australia ICOMOS Charter for Places of Cultural Significance (Burwood, Australia: Australia ICOMOS Incorporated, 2013). 2. Alison Heritage, Cecilia Anuzet, Erika Andersson, and Catherine Antomarchi, “The ICCROM Forum on Conservation Science 2013: A Collaborative Partnership for Strategic Thinking,” in ICOM-CC Seventeenth Triennial Conference Preprints, Melbourne, 15–19 September 2014, edited by J. Bridgland (Paris: International Council of Museums, 2014). 3. For example, see Jeanne Marie Teutonico and John Fidler, “Time for Change: An Overview of Building-Materials Research for Conservation of Historic Structures,” APT Bulletin 29, nos. 3–4 (1998): 45–49. 4. Samuel Jones, “It’s a Material World,” Studies in Conservation 55, no. 4 (2010): 242–49. 5. David Lowenthal, “Omens from the Mediterranean: Conservation Nostrums in Mare Nostrum,” Studies in Conservation 55, no. 4 (2010): 231–41. Research on selected conservation materials—including cellulose ethers, acrylic and alkoxysilane stone consolidants, Parylene, water-borne resins, and the effects of aqueous light bleaching—that increased understanding of the properties of materials under treatment and advanced knowledge of the chemistry and physics of the agents and processes used in treatment. A three-year diploma course in the conservation of wall paintings, developed in collaboration with the Courtauld Institute of Art of the University of London; the Courtauld continues to offer the course, which has been transformed into a master’s degree program. Investigated risks posed to museum collections by atmospheric pollutants and indoor-generated pollutants; also researched passive sampling devices and mitigation methodologies. A collaboration with the Egyptian Antiquities Organization to conserve the 3,200-year-old wall paintings in the Tomb of Queen Nefertari and to develop a long-term maintenance plan for the tomb. A series of courses and workshops for professionals to increase awareness of the need to apply basic conservation principles in the care of archaeological materials and in the management of archaeological sites. A series of courses for curators, conservators, archivists, and others responsible for collections of historic photographs on the conservation and preventive care of photographic materials, especially historic photographs and negatives. A series of short- and long-term courses focused on rock art conservation, site protection, and site management that included on-site training for those responsible for the protection of rock art sites. A long-term research project on adobe consolidation conducted at historic Fort Selden in collaboration with the Museum of New Mexico State Monuments; research identified a multistep process using three chemical procedures that effectively stabilized sections of the adobe ruins. Development of methodologies to identify binding media in paint, including a kit using medical diagnostic technology for identification of the major binding media types encountered in the conservation of ethnographic art objects. A repository of reference materials that can be used by the field for research in the analysis of art objects; it currently houses more than sixteen thousand samples. A series of courses for conservators, collection managers, and conservation educators focusing on the management of the environmental conditions under which collections are housed and used. Researching and developing methods to provide seismic stabilization for historically and culturally significant buildings located in earthquake regions; a component of this work was the Getty Seismic Adobe Project (GSAP). A collaboration with the State Administration for Cultural Heritage of the People’s Republic of China to research and implement site stabilization and conservation strategies at two ancient Buddhist grotto sites and to train technical staff. Developing and applying an appropriate system of protection for the fourteenth-century glass mosaic on St. Vitus Cathedral in Prague, in collaboration with the Office of the President of the Czech Republic. A collaboration with the government of Tanzania, through conservation and site maintenance, to protect the hominid footprints at Laetoli, at 3.6 million years old the most ancient traces yet found of humanity’s ancestors. With the government of Benin, preserving a unique record of the reign of Dahomey’s King Glélé by conserving the oldest bas-reliefs from the Royal Palaces of Abomey, a World Heritage Site. A collaboration with the Instituto Nacional de Antropología e Historia in Mexico to investigate the condition of cave paintings in the Sierra de San Francisco in Baja California and to recommend policies for their conservation. Developed and promoted national guidelines for the conservation and management of cultural heritage sites in China, Principles for the Conservation of Heritage Sites in China, in partnership with China’s State Administration for Cultural Heritage, the Dunhuang Academy, and the Chengde Cultural Heritage Bureau. Developed economical and sustainable climate control strategies for significantly reducing biodeterioration by improving collection environments in historic buildings in hot and humid regions. Working with the Dunhuang Academy, designed, implemented, and disseminated a methodology for the conservation of wall paintings in Cave 85 of the Mogao Grottoes—following the China Principles, as presented in Principles for the Conservation of Heritage Sites in China— that is adaptable to other cave temples at Mogao and to other Silk Road sites. Collaborative scientific research addressing important questions and concerns regarding the use of solvent-based gels as cleaning systems for painted surfaces. Collaborative scientific research to enhance knowledge of the fundamental properties and performance of high-calcium lime mortars and plasters. Developed tools and methods for use by conservators and allied professionals for assessing values and for applying the results of such assessments to sustainable conservation and management solutions. A partnership with the International Centre for Earth Construction—School of Architecture of Grenoble and ICCROM with activities that focused on the study and conservation of earthen architecture in the areas of education, research, planning and implementation, and advocacy. An initiative to develop and reinforce conservation practices through collaborative efforts toward resolving common problems in the Maya region; working with local authorities, projects included development of a management plan for Joya de Cerén in El Salvador and a conservation strategy for the Hieroglyphic Stairway at Copán in Honduras. Researched the objectives, methods, funding, and incentives necessary for a comprehensive citywide survey in Los Angeles and worked with city decision makers and stakeholders to implement a survey program; worked with the city to develop and launch HistoricPlacesLA: Los Angeles Historic Resources Inventory, an online information and management system to inventory, map, and describe historic places in Los Angeles. Applying the findings of the Collections in Hot & Humid Environments project, investigated controlled ventilation, heating, and dehumidification as viable climate control strategies for improving collection environments in historic buildings in hot and humid regions. Scientific research seeking to reduce the damage to works of art on paper caused by museum lighting, through the reevaluation of current illumination guidelines and the testing and design of new lighting. An advanced international course in architectural conservation, heritage recording, and information management, offered three times in partnership with ICCROM. A collaborative project to strengthen rock art preservation, conservation, accessibility, and management in the Southern African region through education and training activities. The only graduate academic conservation program on the West Coast of the United States and the only US program to focus on archaeological and ethnographic materials; developed through the efforts of the GCI, the program is a partnership of the Cotsen Institute of Archaeology at UCLA and the Getty Trust. An initiative to further the conservation of earthen architecture through training, research, planning and implementation, and advocacy; projects include the Conservation and Rehabilitation Plan for the Kasbah of Taourirt and the Seismic Retrofitting Project. A major science initiative investigating the many and varied conservation needs of modern and contemporary art; projects include research into modern paints, plastics, and outdoor sculpture. Addresses the need for enhancing capacity in the conservation and management of archaeological mosaics in the Mediterranean region through training, research, network building, and dissemination and exchange of information; a partnership of the GCI, the Getty Foundation, ICCROM, and the International Committee for the Conservation of Mosaics. A collaborative training project to advance the field of photograph conservation by building the capacity of professionals who care for and manage collections; the project includes the Middle East Photograph Preservation Initiative and workshops in central, southern, and eastern Europe. A multiyear project on the conservation and management of the tomb of Tutankhamen, in partnership with Egypt’s Ministry of State for Antiquities. A collaboration of the GCI and World Monuments Fund that developed an open source, web and geospatially based information system purpose-built to inventory and manage immovable cultural heritage; current developments include formation of an open source community to further the software’s development and its adaptation by a number of cultural heritage organizations. A collaborative project with the City of Los Angeles to complete conservation of the David Alfaro Siqueiros mural América Tropical and to construct a shelter, viewing platform, and interpretive center placing the mural in its historical and artistic context. 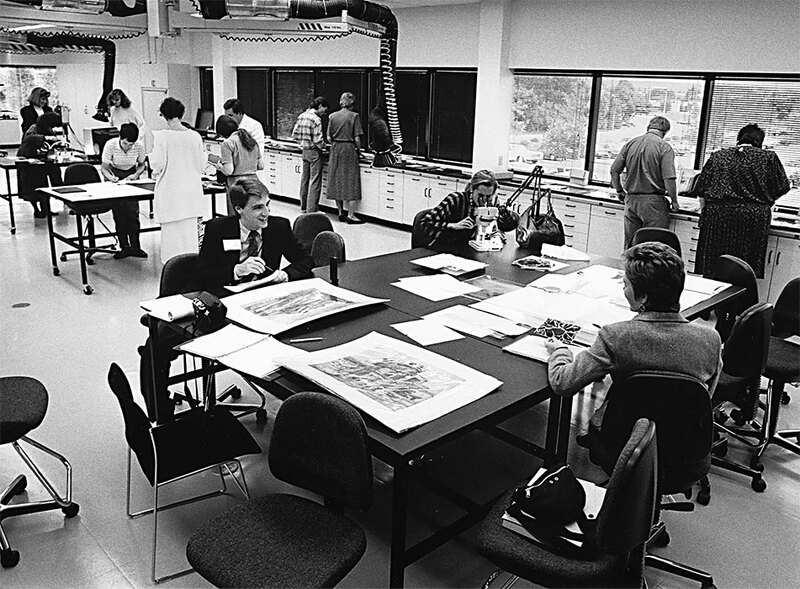 A comprehensive program to advance conservation of modern architecture through research and investigation, the development of practical conservation solutions, and the creation and distribution of information through training programs and publications; projects include the Eames House Conservation Project and the Salk Institute Conservation Project. A multiyear initiative addressing compelling research questions and practical issues pertaining to the control and management of collection environments in museums, libraries, archives, and other repositories; projects include Museum Lighting Research.